I devised Broadford Bay in 1990 and it appears in the Skye Collection Vol 1 and was adopted by the RSCDS in the Leaflet Dances in 2001. Despite the popularity of the dance, the Chase and Turn movement (Bars 17-24) still appears to pose problems with many dancers. I have devised Moonen Bay to try to clarify the Chase and Turn movement (Bars 9-16). 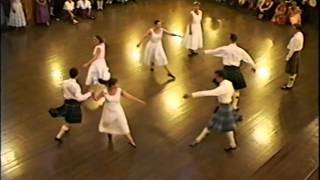 I have often suggested that Broadford Bay could be taught firstly in Strathspey time which may help the dancers to understand the movement. Good Luck! Added on: Feb. 22, 2015, 11:35 p.m.
Budapest Local Club 09.04.2015 2015-04-09 Zoltán Gräff April 28, 2015, 9:26 p.m.
RSCDS Leaflet Dances 1st 11 dances Jane Rose March 6, 2018, 7:21 p.m.
Scottish Flowers Hildesheim 2016-08-15 2016-08-15 Cord Walter Aug. 15, 2016, 10:46 p.m.
Delmenhorst 2014-11-04 Sir Toby Nov. 6, 2014, 9:52 a.m.
Oldenburg 2014-11-17 2014-11-17 Sir Toby Nov. 18, 2014, 6:55 p.m.
170717 The More Unusual Dance Club 2017-07-17 Peter Dixon June 27, 2017, 2:33 p.m.
Budapest Local Club 05.03.2015 2015-03-05 Zoltán Gräff March 6, 2015, 9:25 a.m.
Budapest Local Club 08.05.2014 2014-05-08 Zoltán Gräff May 8, 2014, 9:50 p.m.
Easter Course Kuckucksnest 2014 Truus de Ceuster April 21, 2014, 11:23 p.m.